Scrubbing your way to perfection? Not such an issue when you've got Caudalie products in your tub! 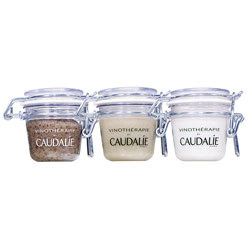 The three glass jars in the Caudalie Scrub Trio look like they should hold sugar and flour and belong in your grandma's kitchen -- but luckily these ones are for the bathroom only! Essential oils, honey and sugar are blended with grapes to bring you the softest, smoothest skin around. Each is formulated to solve a certain skin worry -- Crushed Cabernet Scrub is majorly exfoliating and even slimming, Merlot Friction Scrub exfoliates and firms, and Sauvignon Scrub exfoliates both the face and body to bring about an assured glow. check my blog for info.